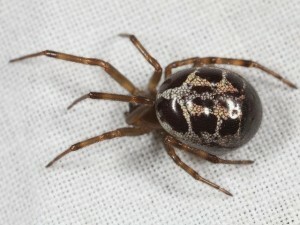 The False Widow Spider (latin name steatoda nobilis) is a spider that is found in the UK. Primarily they can be found in the south and south-west of England. However in recent months there have been many reports of the spider spreading northwards. There have even been reports that the spiders have been found as far north as Scotland. There are 12 species of biting spider known in Britain, however the false widow spider is known to be the most venomous spider in the UK. The false widow spider is not native to the UK and it is thought to have arrived in the UK in crates of fruit from ships arriving from the Canary Islands in the late 19th Century. The first reported sighting of a false widow spider in the UK was in Torquay, South Devon, in 1879. It is thought to be well established in the South West due to the milder weather which the spiders have adapted to. The false widow spider is also found in mainland Europe, Madeira, the Canary Islands and Africa. 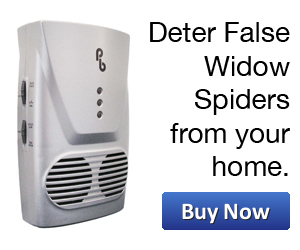 As the name suggests, the false widow spider is often mistaken for the infamous Black Widow Spider. The false widow spider is actually part of the same family as the black widow spider, though nowhere near as dangerous and toxic. The spiders have a dark, shiny body and a large, bulbous abdomen. It normally has pale markings on it’s body, which some have said resemble a skull on it’s back. Female false widows normally have a body which measures 15mm, whilst the smaller males normally have a body measuring 7-10mm.